Cross compiling is supported by the ASN.1 Tools for C. Cross compiling enables a developer to produce files that can be used on a different operating system than the one the compiler runs on. Maximize your investment with the ability to cross-compile. Learn more about cross-compilation. The OSS encoders/decoders provide, among many other features, the ossEncode() and ossDecode() functions. The ossEncode() function takes data placed by your application program in the compiler-generated C data structures and converts it to a string of bytes encoded according to BER, CER, PER, CPER, OER, COER, DER, XER, CXER, E-XER, or JSON. This utility, included with the ASN.1 Tools for C, takes a BER or DER encoding in ASCII or binary format from an input file and writes it to an output file in one of three different type-length-value (TLV) formats. The other function, ossDecode(), takes a string of bytes that have been encoded according to BER, CER, PER, CPER, OER, COER, DER, XER, CXER, E-XER, or JSON and performs the inverse operation of the encoder, resulting in a C data structure that you can easily manipulate. The space-optimized encoder/decoder (SOED) is so named because its emphasis is on minimizing use of memory, especially when the abstract syntax is large or complex. Both the encoder and decoder possess a simple yet flexible memory management interface as well as a wealth of tracing, error trapping, diagnostic and recovery capabilities. Runtime functions, supporting PDU copying, comparing, printing and more, make your application development process easier. The time-optimized encoder/decoder (TOED) has a program call interface identical to the space-optimized encoder/decoder's and performs the same function (except that it does not possess any tracing capability), but its emphasis is on minimizing CPU utilization. The OSS runtime libraries have been ported to 500+ platforms, including many embedded platforms. 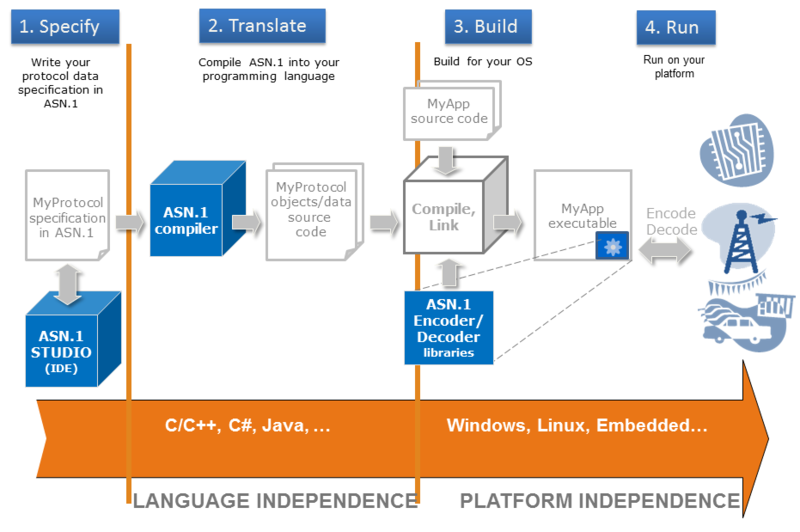 The Interpretive ASN.1 API (IAAPI), included at no extra cost in the ASN.1 Tools for C, can be used in conjunction with the regular ASN.1/C compiler (when the ASN.1 schema is compiled at the time when the application is developed), or with OSS' Compile-And-Go Library (CAGL) (when the schema is compiled dynamically at runtime). IAAPI provides means to get information about the details of a compiled ASN.1 schema, including the types it defines (say, a record with multiple components), the fields of a type (say, an integer and a string) and the constraints associated with them (say, a smaller-than-10 integer). This information allows developers to write code that parses the content of a message, which is particularly useful when its structure is unknown at application development time. Similarly, developers can write code to create, field by field, a new message, so long as its format obeys the schema compiled. IAAPI supports ASN.1 BER, CER, DER, PER, CPER, OER, COER, XER, CXER, E-XER, CSV, and JSON. For a list of the ASN.1 standards that the OSS ASN. Tools for C conforms to, see the Standards Conformance page.